Many reviews that I had read before the release of Joe Cornish's Attack the Block have described it as a gritty version of The Goonies. At no point while watching the film was a reminded of the magic and adventure had by the Goonies while searching for One-Eyed Willie's fortune. Instead, at the beginning of the film I found myself disgusted with who would soon become the main characters, a group of unlikeable thugs who belong in mug shots, not the silver screen. This thought did nothing else but solidify the impressive way that Cornish captured the hopelessness and deep rooted innocence of a group of kids from South London. "From the producers of SHAUN OF THE DEAD and SCOTT PILGRIM VS. THE WORLD comes ATTACK THE BLOCK - a sci-fi/comedy/action/adventure mash-up, that pits a teen gang against an invasion of savage alien monsters. It turns a London housing estate into a sci-fi playground. A tower block into a fortress under siege. And teenage street kids into heroes. It’s inner city versus outer space! Two-time British Independent Film Award Nominee." One part Shaun of the Dead, one part War of the Worlds and one part Dizzee Rascal, Attack the Block manages to turn a bunch of horrible thugs into the heroes of a science fiction/horror film much to the credit of first time director, Joe Cornish. We start the film with a rag tag group of hoodie wearing street thugs, lead by the stoic Moses (John Boyega), and leave with heroes who have suddenly grown into young men in the space of 88 minutes. 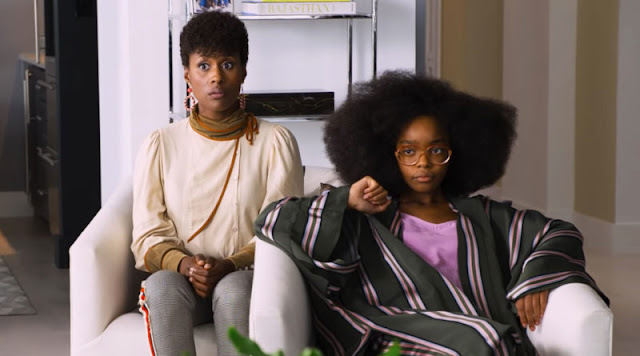 In no way would I claim that I would invite these characters over for dinner at the end of the film, but I do believe that they are slightly less likely to steal your wallet. Instead of miraculously turning the boys into saints, Cornish shows why the children (and realistically, they are children) are the way they are. They are victims of circumstance in a place where thuggery is glamourised as well as a means of survival. The group of young actors, headed by John Boyega, are all incredibly convincing as Sowf Lond'n street rats, walking with a swagger and sprouting almost nonsensical dribble incessantly leaving you questioning whether the English language actually did originate in England. Boyega is especially engaging and gives a raw performance that had me convinced that he must have been from this world but from all accounts, he is not. His performance was just that good. 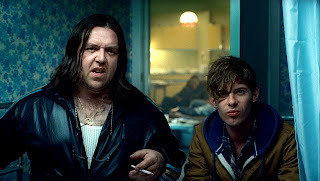 Given the relationship between Cornish and Edgar Wright it is no surprise that we see Nick Frost make a cameo in this film. Thankfully he only appears briefly and sporadically so he doesn't detract or overshadow other performances but when he does appear, hilarity ensues. The score is a brilliant blend of orchestral and electronic supplied by Steven Price and Basement Jaxx. This helps to maintain a cinematic convention while instantly injecting a healthy dose of street level London, itself saving from a flighty self-importance that would have detracted from the grittiness of the films tone. Designed on a modest budget, the creatures are almost as simplistic as you could possibly imagine. Completely devoid of colour apart from their blue, glowing gnashers, the end effect is surprisingly effective. The fact that these creatures could be completely camouflaged in any dark area makes you second guess every scene and makes for some edge of your seat frights. Attack the Block is an incredibly strong debut for Cornish and one that will no doubt go down in the annals of history as significant as Shaun of the Dead. It is a beautifully shot film with some wonderful performances, an engaging and perfectly suited soundtrack and the perfect balance of horror, action, comedy and heart. The one thing that resonated most with me was that this film was obviously a labour of love and it shows. 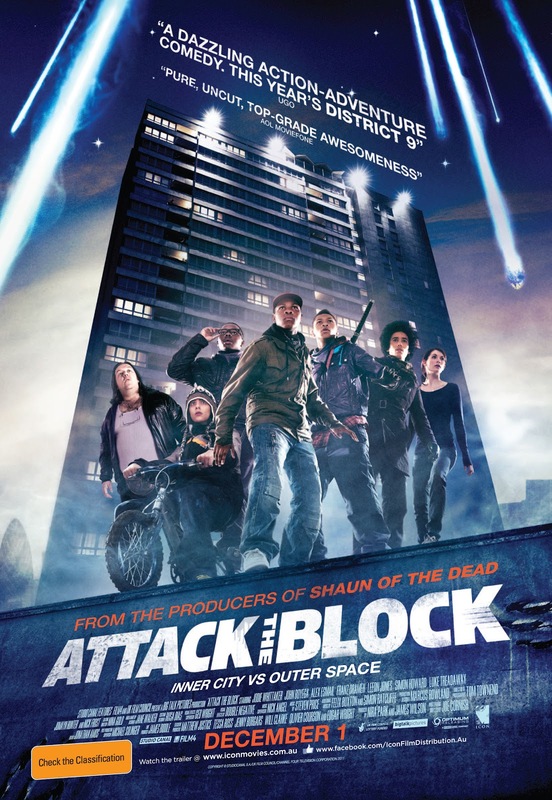 Attack the Block is in cinemas from December 1st. Make sure you check out our competition to win a double in-season pass to Attack the Block, thanks to Icon Movies. Hey, great review! Really enjoyed the film - thought it was a great choice to open BIFF. Thanks Katia! It was a great film and a by a first time director no less. I should get to BIFF one day, sounds like a good'un!